From attorneys to professional administrative staff, our firm's success depends on hiring talented people for every position. We emphasize the importance of developing and retaining high-quality professionals who are driven to make a positive impact. If you are seeking a position that demands excellence and rewards skill, initiative, and hard work, please review our job openings and contact us. Sussman Shank LLP is an equal opportunity employer. Sussman Shank LLP is seeking a business attorney with 2 - 5 years of experience in business transactions, real estate matters, and business succession planning. Excellent educational credentials are required; tax experience preferred. Please address cover letters and resumes to our Chief Operating Officer, Steven T. Seguin. 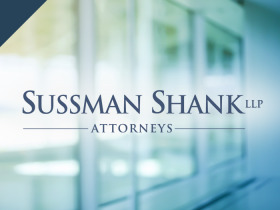 Founded in 1960 in Portland, Oregon, Sussman Shank is a full-service business, litigation, and commercial bankruptcy law firm with over 30 lawyers. Our clients include public and private companies, government entities, institutions, non-profit organizations, and individuals. In 2019, we were recognized by the Oregon Business magazine as one of the 100 Best Companies to Work for in Oregon (for 13 years), and one of the 100 Best Green Workplaces in Oregon (for 8 years). We were also recognized as one of Oregon's Most Admired Companies by the Portland Business Journal in 2018. We are seeking an experienced Legal Assistant for our Business Practice Group. Candidates should have at least 2 years of experience in general business. Experience in healthcare transactions, M &A transactions, loan documentation, and HIPAA are a plus. The ideal candidate should be energetic, responsible, organized, and work well in a team setting. Founded in 1960 in Portland, Oregon, Sussman Shank is a full-service business, litigation, and commercial bankruptcy law firm with over 30 lawyers. Our clients include public and private companies, government entities, institutions, non-profit organizations, and individuals. In 2018, we were recognized by the Oregon Business Magazine as one of the 100 Best Companies to Work for in Oregon (for 13 years), and one of the 100 Best Green Workplaces in Oregon (for 7 years). We were also recognized in 2018 by the Portland Business Journal as one of Oregon's Most Admired Companies. We have an immediate opening in our business practice group for a highly-skilled transactional lawyer with seven plus years' experience as lead counsel on significant M&A transactions, creation and negotiation of commercial loan documentation, and outside general counsel advice. An ideal candidate has an advanced tax degree and shows dedication to business and practice development.